If you have a Windows, Samsung Smart Signage Platform or ONELAN device you can add a live stream to your layout by adding the IPTV widget into a zone. Select your designated zone and enter the zones playlist by double clicking on the zone, or click 'Edit Zone Playlist'. 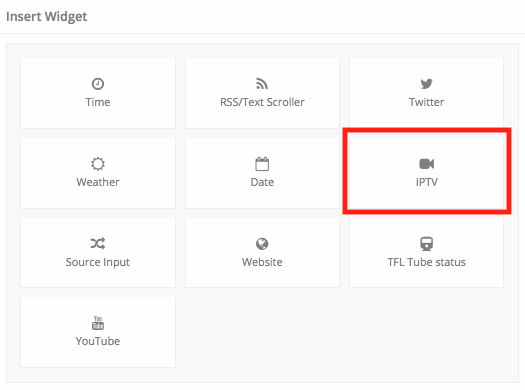 Click 'Widget' and select 'IPTV' to insert the IPTV widget. The only setting you need to configure is the URL for the stream. The stream will only work if the feed is coming from either a HLS, UDP or RTSP URL. Supports RTSP, HLS or UDP. Zone with IPTV widget inserted MUST NOT have a background colour or image. ONELAN NTBs - must be on 9.3.7+, be multi zone and have stream-in license.